f you?re a keen photographer and about to head off on the travel adventure of a lifetime, why not leave that heavy, awkward tripod behind! Travel light with the ingenious Camera Stabilising Bag (CBS) ? the new ?must have? 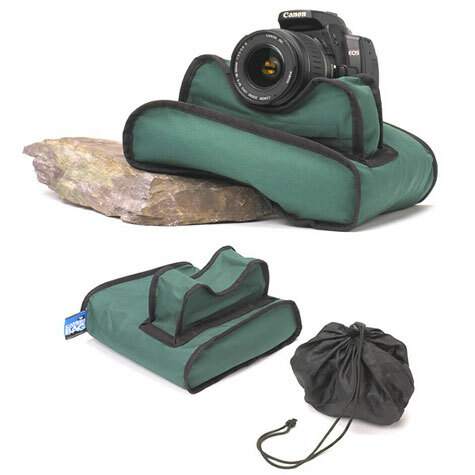 accessory in the photographic world! The CSB gives you all the benefits of a regular tripod without the size and weight! Capture a stunning sunset, perfect that personal portrait or sharpen those night shots with this amazingly lightweight piece of camera kit. With lens support like this, you?ll have a safe platform for even the longest zoom lens but without the worry of your camera slipping or moving like you might expect with some of the more lightweight tripods. The CSB is a new product that is so ingenious; you?ll wonder why you ever dragged around your tripod in search of a stable or even surface to get those National Geographic-like photographs! Climb a giant sand dune in Namibia, swing from a vine in the Amazon or perch precariously on the Great Wall of China, no matter how daring your adventure, the CSB will be there to help you document it pictures! The CSB is perfect for mounting your SLR on safely and offers you all the features and benefits of a normal tripod, but so, so much more. Made of hardwearing but light-weight fabric, the CSB packs itself easily away into a compact and light little package no bigger than a tennis ball ? a far cry from that heavy, awkward tripod! So how does it work we hear you ask? Easily is the answer! Just unfold the CSB from it?s built in storage sack, turn it over and fill it with whatever you can find (sand, dirt, rice ? anything! ), fill up the lens compartment to the desired height and PRESTO?you have a safe and protective, level platform for self portraits, night shots, long exposures?or just about any photographic requirement! The CSB is perfect for on-the-go photographic expeditions, shoots in the great outdoors where level surfaces are few and far between and any photographic feat that requires a strong, level surface to get that dream shot. When you?re done, just tip out the contents of the camera bag, fold up, and you?re away onto the next shoot! The CSB makes a perfect gift for any keen photographer or traveller and will make photographing life so much easier and more enjoyable! Do yourself a favour and be one of the first to get one of these brilliant accessories today! Do yourself a favour and join the thousands of other photographers who enjoy all the benefits of this brilliant accessory today! * Can be filled with rice, dirt, gravel, beans anything thats at hand! Please Note: The Camera Stabilising Bag is machine washable in a cold wash, should not be bleached or ironed and should be kept out of reach of children.